Soak channa overnight in water. Take 2 glass of water in pressure cooker add cinnamon, cloves, cardamom and channa in water. Put this on high flame and wait for 2-3 whistle. Then put the cooker on slow flame for another 30 min. After 30 min if the channa are completely boiled then heat oil in heavy bottom small pan. Then slow the flame of gas and add jeera and coriander powder when coriander powder turn brown add grated ginger in oil. When ginger turns its color then add garam masala and red chilly powder. Then put this tadka in cooker. Add salt, dry mango powder in cooker. Boil this for 15 min more. 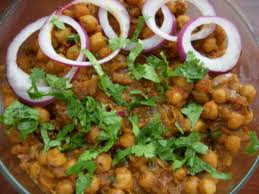 Garnish the channa with tomato, onion and green chilly. Serve this hot with puri or bhatura.